:The first instance of spiritual warfare recorded in the Bible is an encounter between a woman and the devil--and on the heels of that ill-fated meeting, God decreed that the woman and her offspring would oppose the evil one forever. The role of women in society and in the church is, even today, hotly debated. 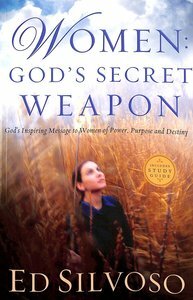 In Women: God's Secret Weapon, Ed Silvoso dares Christians everywhere--men and women--to battle against the kingdom's true enemy: Satan. In this edition, which includes a brand-new study guide, Silvoso (founder of Harvest Evangelism) persuasively presents the Bible's portrayal of women as powerful adversaries of the devil. Here is inspiration for men and women to work together for the evil one's defeat. Silvoso, author of That None Should Perish and Anointed for Business, grew up in "macho Argentina." Yet through more than forty years of marriage to Ruth and becoming the father of four daughters, in addition to decades of ministry with both women and men, he has been a firsthand witness to the enduring strength and spiritual authority women can possess. Women: God's Secret Weapon is a challenge to the Body of Christ to recognize the unique, strategic and pivotal place women have in God's plan for Satan's ultimate ruin, and to celebrate the invincible power of an undivided church. About "Women: God's Secret Weapon - God's Inspiring Message to Women of Power, Purpose and Destiny"
Ed Silvoso is the founder and president of Harvest Evangelism, Inc. A native of Argentina, he is widely recognized as a teacher on evangelism, restoration and Church unity. The author of four books, That None Should Perish, Prayer Evangelism, Women: God's Secret Weapon and Annointed For Business. Silvoso also has extensive experience as a family counselor. He and his wife, Ruth, reside in San Jose, California.